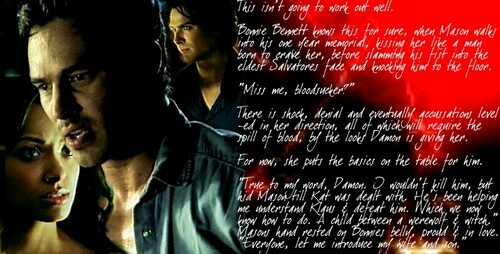 Masonnie/Bamon PC. Damon is none too happy at Masons Memorial, Bonnie reveals more than she intended.. Wallpaper and background images in the Bonnie's Multi Shippings club tagged: bonnie bennett tvd the vampire diaries damon salvatore mason lockewood. This Bonnie's Multi Shippings fan art might contain sign, poster, text, chalkboard, portrait, headshot, closeup, anime, comic book, manga, and cartoon.